Daniel Abraham writes unconventional fantasies like The Long Price Quartet and the Hugo-nominated “Cambist and Lord Iron” (available here in podcast form). Now he’s launched a new high fantasy series, Dagger and Coin, with its first volume, The Dragon’s Path. The packaging is rather conventional, leading you to believe that this is going to be a huge, sprawling fantasy epic with a varied cast involved in a giant, continent-wide war against the forces of ultimate evil. Which is true. So I hasten to add— but it’s GOOD. Because Daniel can’t seem to write anything that isn’t really, really smart, and that doesn’t have characters that surprise and engage you. And because you go into the book thinking you know the terrain— because, after all, the book comes with a map— but in fact Daniel shows you all the tracks and paths that were there all the time, but that you didn’t know existed. He makes the multi-volume fantasy quest epic new— which is good news for all of us. I’ve had the pleasure of reading this book, and it has my personal five-star guarantee. I’m also informed that the Kindle edition of Dragon’s Path comes with a entire bonus novel attached, the as-yet-unreleased Leviathan Wakes by James S.A. Corey. Which is a big huge space opera with detectives and revolution and mass murder and all sorts of what-all, by a talented newcomer who happens to be sleeping with Daniel Abraham’s wife. But don’t think about that, just think about two books for the price of one. And get readin’, cuz that’s what I’m going to do. He only sleeps with Daniel’s wife half the time. The rest, he’s sleeping with mine. Thanks for the recommendation. I’m enjoying this considerably. Last time you recommended this guy I quite enjoyed it, so I’ll go check it out. And there’s a Kindle edition! 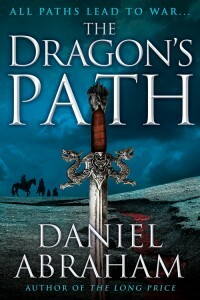 I finished The Dragon’s Path early in the week, and your recommendation was spot-on. But I’m enjoying Leviathan Wakes even more. Will probably finish with that later today, once the current chore list is done. Previous post: I’m Tired . . .